A very bloody incident after stabbing 3 people inside and out of the Target store in Pennsylvania, Monday evening, according to report by Fox8 Cleveland site. Police told to reporter that the man used the kitchen knife to slashed two men and seriously stabbed the teen girl. 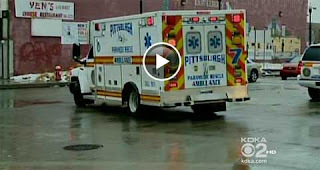 According to Pennsylvania TV station KDKA, the man grabbed the 16-year-old girl away from her family at the checkout counter and stabbed the girl in the back and arm. Police used the pepper spray to subdue the suspect and get the girl out of him. The girl was rushed to the Children's Hospital in critical condition, but later, Police said, the girl was upgraded to serious condition. Comments or suggestions about "Stabbings at Target store in Pennsylvania" is important to us, you may share it by using the comment box below.